Singing bowls are sometimes used in ceremonies. As most people have never seen or heard one before it is often an exotic experience for them. The nature of their sounds demands moments of silence, reverence and respect, often necessary for the kind of ceremony they are used in. They can be used to open or close a ceremony, or played at a significant moment. 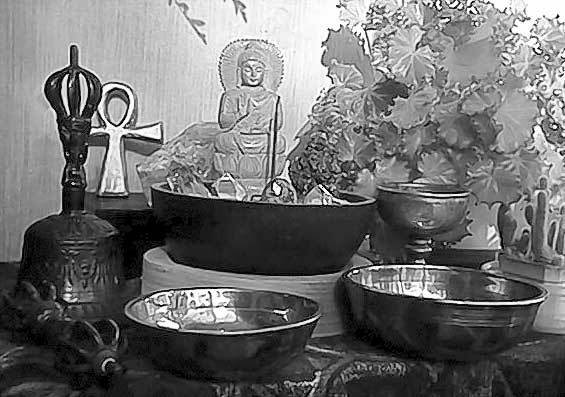 As sound is a carrier of energies, singing bowls can be used in magic. Formulate clearly what you want and send it out on the sound waves of your singing bowl. Know what you are sending out, as any negative intent, or badly formulated wish, comes back at you. What you send out, you receive, thus you must know what it is you want to deal with. Never impose something on another person as we must not interfere with another person’s life. If you really want to send healing energies to somebody, you always need to add "on the condition that the higher self of that person is ready to accept this healing energy". Sometimes people do not want to heal (even if they claim they do), as their illness has certain benefits for them that they are not willing to give up. Playing a singing bowl with an intention can make the playing much better. You can play to the birds, they love it, to the whole earth, or for world peace. Create your own rituals and ceremonies, they don’t have to be complicated or take a long time. Just having a singing bowl with you and using it can make an ordinary situation into a magical one.